22 March the first discussion of the newly introduced “Kharkiv International Talks” series was held in “Shostyi Kut” (Sixth Corner) club. The event co-organizers were Maidan Monitoring Information Center and Kharkiv Observer edition. Natalia Zubar, head of Maidan Monitoring Information Center and coordinator of Ukrainian Peacebuilding school, highlighted that such public discussions of stinging issues would help to overcome problems and to connect people. “We feel that Kharkiv can become a place where we might discuss the most actual issues concerning the future of Europe and the world as a whole. We would join the discourse where the future world might be reinvented, or even initiate this discourse”, explains Taras Danko, the professor of international business and KhO editor. As one of this public event organizers, Taras Danko regards the initiative as an attempt to peer into the new future international relations and tendencies, and he hopes that wide Kharkiv community would be interested in joining the meetings. Yesterday’s lecture was Andriy Kamenshchikov, a sociologist who started his peace building activity in the early 90s. 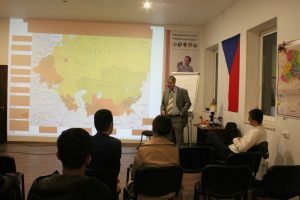 He is also a representative of a US-based NGO Nonviolence International and a regional coordinator of an international civil society network – the Global Partnership for the Prevention of Armed Conflict (GPPAC) in the Eastern Europe region. Andriy Kamenshchikov regarded some effects of the events which took place in the post-soviet countries including Ukraine since the 90s and which had a profound impact on their societies and politics. Main conflicts origins, features, particularities and the ways to overcome them were regarded and afterward discussed by the participants. Maidan Monitoring published the whole lecture video at the own channel. According to Taras Danko, similar talks in English might be arranged once a month. Вільний Університет “Майдан Моніторинг” запрошує на святкову ігротеку!